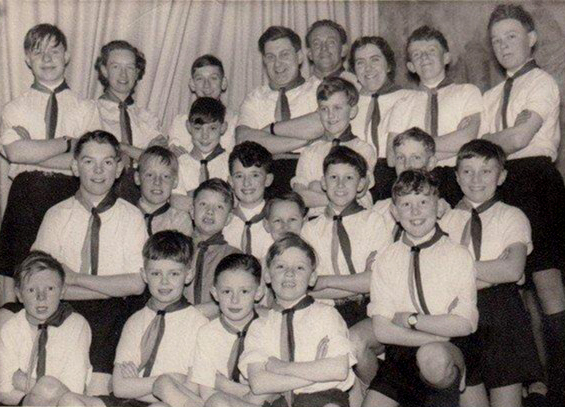 Bottesford Boy Scouts, possibly c.1960. Can anyone help us confirm the where and when this was taken, and identify the people seen in it? I think the boy at the very front on the right hand side of the photograph might be Stuart Spalding. Happy New Year Neil from the Colonies. The venue, I’m almost sure, the old VC Hall and around late 50s to early 60s, possibly a Gang Show. Back row L to R: Robert Taylor, Anne Dunsmore, X, Bolland, Eric Buxton, X, Tinkler Snr, Margaret Buxton, John Tinkler, Barry Gamble. Mid row L to R: Anthony Whatton, Michael Turrell, X, Phillip Taylor, X, X, John Topps, X, Tinkler. Front row at left hand end: Robert Donger, others not identified. The boy on first row left hand side is, I think, Peter Donger from the Hollies Farm in Easthorpe. As for where it’s taken, I’m not sure but I did attend the Cubs with him on a couple of occasions and, I stand to be corrected on this, I think at the old VC Hall at the playing fields. We used to bike along the footpath from Easthorpe Lane past what l think was doctor Woll’s surgery on the left. The gray matter is a little bit cloudy these days. Dear Michael and Tony, thanks for sorting out the details of this photograph. Where would this archive be without supporters such as yourselves? With best wishes, Neil.